Here are some of my last publications. I don't make photography for a living. I practice for my pleasure, for the associated human and social relationships, for Art. So my aim is not to sell, you will never see my pics on the front page of fashion magazines. My illustrations are for friends and relations. Julia Wheeler featured in the Daily Telegraph Australia Monday 16 Jan17 showing some of her awesome images plus some great images of her in her element. This edition displays some pictures I made of Julia when she visited me last December. An article about me in this same issue, written by Anne Riou. In this issue there was a long article about Fakarava south channel. This is a place I love. I go there several time each year at Tetamanu with Sané and Annabelle who are running the place and the diving center. Each year in july lot of divers come there to observe the grouper's spawning. This is the last cooperation in a row with "Plongeur International" magazine. I made the cover to illustrate the spring season when it's time to review your equipment. 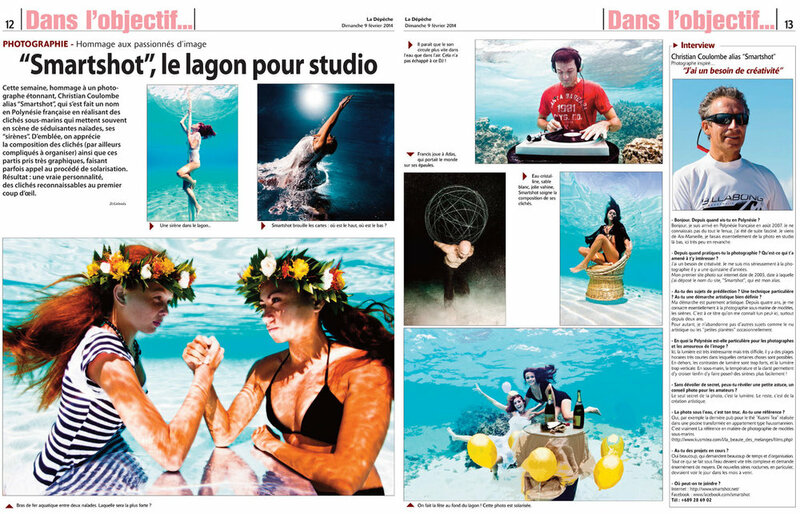 This pic has been shot in Tahiti in the lagoon with friends Alice, Julien, Francis and Stephane. This is my first cover for the magazine. The theme "Apnea" was an invitation. Kalani is an invitation to practice. The local newspaper in 2014 made a series of articles with local photographers.